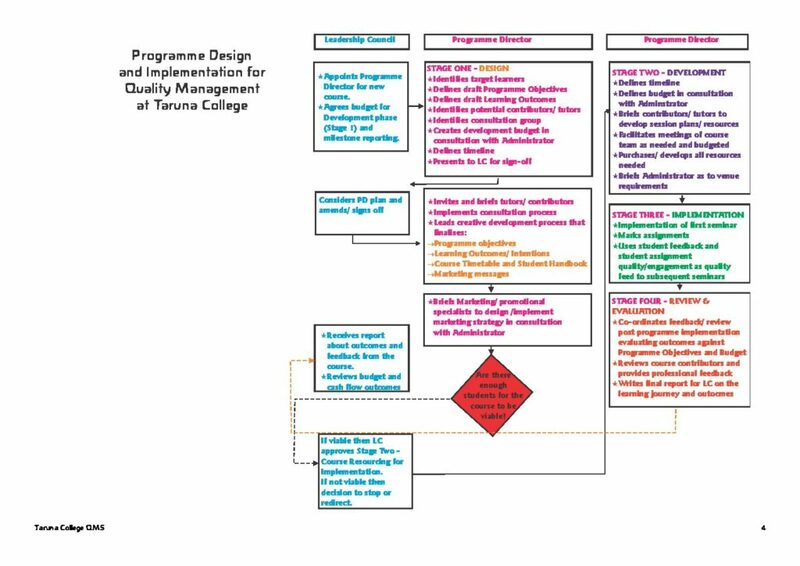 Taruna College’s Educational Quality Management System (QMS) provides assurance for students that their own learning journey is underpinned by contemporary teaching and learning theory, and a standard of teaching excellence. For Taruna tutors it shapes and defines the learning process. Together these create the Taruna learning culture. Taruna College’s learning programmes honour two streams of quality. The first is best practice adult education that is current and relevant to NZ society. The second is through the College’s special character of anthroposophy, where processes, approaches and content carry a deep understanding of the nature of the healthy human being. Programmes offered are grounded in, and respond to, a bicultural and multicultural Aotearoa / New Zealand and acknowledge the Treaty of Waitangi. Student diversity in all its facets is a strength that underpins everything we do at Taruna. 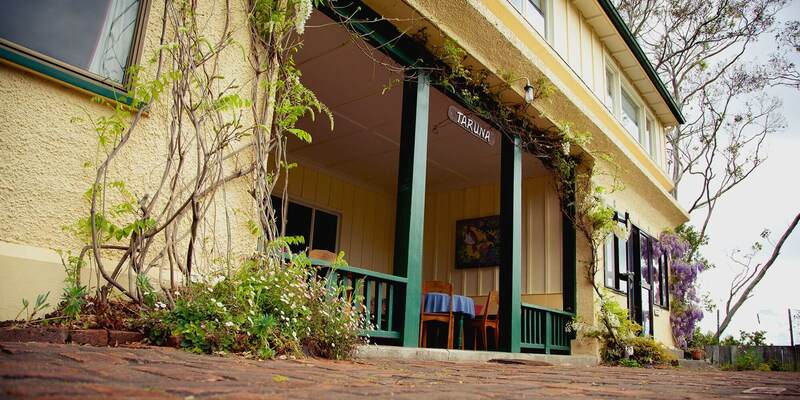 Taruna College especially works to integrate Te Whare Tapa Wha where every dimension of health and well-being are recognised in the learning process: physical; family; spiritual, emotional. Students then manage themselves according to each dimension, for example with their own physical and emotional comfort; with maintaining healthy boundaries. Every learning programme is designed as process learning. The integrated human processes of thinking, feeling and doing are carried with careful awareness from programme design to implementation and review. Such integrated process-oriented learning enables relevance along with time and space for personal digestion. The aim is to develop an understanding of the creative human being that helps shape each student’s own life journey through reflective practice. Programme delivery and learning experience integrates a variety of modes: e.g. artistic; social; small group work; biography; movement. Respect and freedom are the hallmarks of every learning situation. All Taruna courses follow the quality 4-step process of: Plan-Do/Implement-Review-Learn as the frame for course roll-out. Sources of review are both self-review from tutors involved, and student feedback (including destination learning). Taruna College tutors are skilled in contemporary, best practice group learning processes. They carry responsibility for implementing generative learning approaches that enable learners to construct new knowledge together. This practice demonstrates tutor skill and understanding in the theory of social constructivism. How tutors work facilitates learning, and is inclusive, strength-based, and inspires and challenges students. Every Taruna College tutor is skilled and experienced in understanding and responding to group culture, group dynamics and group processes. Social dynamics are recognised as situational and therefore responded to flexibly and creatively. Taruna College tutors work with pictures that enliven their practice in terms of what it is to be human. Tutors participate in their own annual professional development. Students are called on to be personally resourced in terms of self-management strategies and external support networks as they learn. While Taruna expects courses to be a catalyst for change and self-development, courses do not cross the line from learning support (enabling engagement and participation) into therapeutic support. As adult learners, students are expected to be self-responsible. The frameworks for exploring biography and human life are inspired by an anthroposophical perspective. Uptake of those perspectives (or not) respects the freedom of each learner. Where professional development is the focus of learning Taruna aligns standards with professional competencies of that industry (e.g. nursing or teaching where annual practising certificate or annual registration is the expectation of any tutor). Rather than Learning Outcomes, Taruna College learning programmes have clear Learning Intentions, recognising that healthy adult learning means every student creates their own learning outcomes dependent on their own journey. Part of Taruna’s approach is to have every student begin their learning process by identifying their own aims and focus. It is then the outcomes against these goals that are most relevant for programme journey. While the learning pathway for every programme has a designed structure for delivery this is at a high level, enabling tutors (especially the programme director), to respond to every individual learner, and be flexible in content and approach while satisfying the course intentions. The Taruna learning process is inclusive (lots of points of view); learner-centred environment (responds to feedback and discussion of students). The Taruna learning process integrates the steps of experiencing, making meaning and personalising that these can together be as a catalyst for further student learning and life change. Taruna College has a course fee protection for students and operates a Student Protection Fund that indemnifies students’ monies, and separates these funds from Taruna College operating expenses. Tutors and leadership are engaged with enlivening QMS conversations that consciously evolve and develop this best practice. During course planning and implementation ongoing dialogue at weekly LC meetings ensures quality standards are met. These discussions are minuted in LC minutes. Annually in November, the LC has a QMS focus to review standards of excellence and the QMS system itself. A QMS summary appears in the annual review of business.